Whether you have just one house or two in your Christmas Village or a collection, a tree really brings the building(s) to life! This pattern includes 2 sizes of tree in 3 different colours and the option of leaving them plain or decorated – ensuring your trees in the village can be personalised to your tastes. All trees are made using Japanese Miyuki size 11 Delica beads and Round Peyote is used. It is assumed the beader will be familiar with Peyote stitch, however full instructions are given making this pattern evern suitable for beginners. There are up to 1-4 colours per tree and the finished beadwork is approximately 3.5cm x 2.75 cm for the large tree and 2.75cm m x 2.25 cm for the small tree. 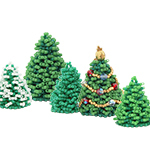 If you want to decorate a tree a 6mm bead and a selection of 3mm and 4mm beads will also be required. The bead pattern supplied is 16 pages and includes full colour photo instructions.